Though strikingly different in tone, TV series The Flash and Arrow were well connected even before the speedster got his own show. Barry Allen (Grant Gustin) was first introduced to viewers in season 2 of Arrow, as a forensics scientist from Central City with a personal interest in a robbery at a Queen Consolidated warehouse. The following mid-season finale showed the particle accelerator-induced storm and the bolt of lightening that turned Barry into a metahuman. The pilot of The Flash included Barry seeking out Arrow for advice on being a superhero. Subsequent interactions included the heavily promoted double-episode crossover events--the first featuring a "Flash vs. Arrow" battle, and the second introducing new characters for the Legends of Tomorrow spin-off. Fans love seeing their favorite characters from the two shows interact, and the ratings have surged for these episodes. So it's not surprising that it looks like there's another crossover on the horizon. David Ramsey, who plays John Diggle on Arrow, posted on his Instagram that he was heading over to the The Flash writers' room. Andrew Kreisberg, executive producer for Arrow, The Flash, and Legends of Tomorrow, promised last summer that the crossovers would be an ongoing thing. After all, when characters live in the same universe, it makes sense for them to team up against particularly tough adversaries. "These shows are linked. If there’s a terrorist attack in Central City, they are going to hear about it in Starling City, just like if something terrible happened in New York, we’d hear about it here in LA. I think there was a concern we had early on, like…sometimes when you expand these things they implode. Instead, they seem to lift each other up." The crossover episodes have been an entertaining way to see a different side of the characters we connect with each week. Arrow can be an incredibly dark show, so it's amusing to see Oliver's (Stephen Amell) uber-serious vigilante persona crack under the onslaught of Barry's infectiously cheery disposition. Each team has unique strengths and skills, and as Kreisberg indicated, combining them seems to bring out the best in the characters--rather than one side overshadowing the other. The large cast of characters does make a crossover a tricky endeavor for the writing staff, and the latest double-episode suffered from the weight of adding even more characters into the mix. 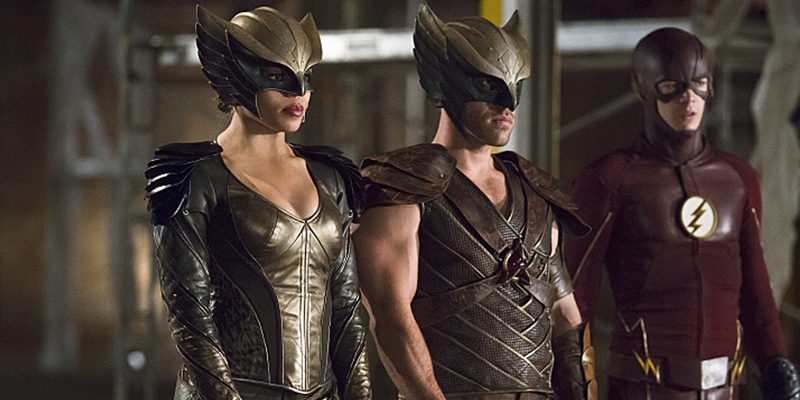 The Flash installment was especially weakened with some poorly-written dialogue and wooden acting from the new Hawkman (Falk Hentschel) and Hawkgirl (Ciara Renée). It also was probably too ambitious with some side plots, like Oliver discovering he has a son, that would have been better served in other episodes. The best thing for the next mash-up of the two shows is to work with a villain we're already familiar with, and there's been plenty of build-up for Arrow's Damien Darhk (Neal McDonough) and The Flash's Zoom (Tony Todd) to make a big showdown event exciting.